A trio of armed vigilantes goes gunning for both street scum and super-villains. But quick executions arent necessarily their style; theyre into punishment. For that they have the House of Correction, an inescapable dungeon far below the Strang Mansion. There, justice is dispensed...despite the law! 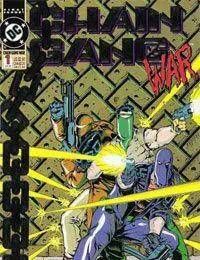 CHAIN GANG WAR is a series set in the gritty underside of the DC Universe, where shocks and twists abound with high-calibre action and intrigue. The Chain Gang has its share of friends and foes: police detective Joe Shanahan wants to bring them in and put them away for good; investigative reporter Marion Hawley wants the inside story on the Gang, and may go to extremes to get it; and the city is so frustrated with crime and motivated by fear that the anger boils into support for the vigilantes.